Low maintenance with only one pivot point up high out of the mud. 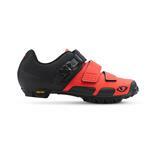 Excellent climber and comfortable ride. Big weakness is the rear triangle breaks at the derailer mount hole. Have broken two frames like this. Other weakness is that the rear dropout slot is not deep enough and rear whee pulls out if you do not have the quick release on mega tight. Brake Therapy adapters can be used to mount modern brakes on this old design. I have owned six extra large Mantras over 20 years and loved every one. The post about pivots wearing out is ridiculous, as they are maintenance free in my experience. 10,000 miles with lots of single track has not worn it out. Good resources on the Klein Mantra FB page. 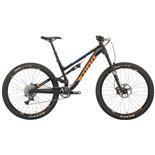 This bike is the best climbing and most comfortable mountain bike ever. 100 RLC FOX on the front is perfect. Design, quality, mine is pre takeover - it matters, durability, the mantra is an underrated bike - i used mine with Z1 Bams and have switched to carbon rigids - this i strongly believe gives you/the rider the best balance. 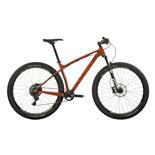 It is not a full susser so if you buy one expecting it to be you will scare yourself to death - XC at most. Gary Klein designed this machine to have rigid front ends. 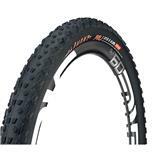 If you have one with forks when braking it dives all over the place, misuse it for downhill etc you will ruin it, and eat those pivot bushes - this isnt a product weakness but a lot of how it was marketed at one point or another. A true weakness is very early rear triangles often broke with no warning. Get one - its a love or hate bike, most that dont like it havent owned one - look after this and will be worth a few some day but for riding pleasure when set up its ace and fun. Try and get a pre Trek one, they look better and are retro as hell. Klein hardtails, Klein Palomino, Kestrel, Specialized, Pro flex, Kona lava dome 1992 in white with splatter paint - i miss that bike!! Reasonably light. Stiff frame. Great climber both in and out of the saddle. The bike accelerates like no other full suspension bike I have ridden. Quick and agile handling. No pedal bob, or to be specific, the pedal bob does not affect the pedaling efficiency. This bike pedals just as good as a hardtail bike. The finish of the frame (welds, paint job and so on) is very, very nice. It has an exclusive and expensive feel to it. The bike always gets a lot of attention, even though I must admit that not all of that attention is positive. People either love or hate this bike. Descents! When you brake with the front brake, the rear suspension extends all the way. This results in the bike's wheelbase shortening and the rider is lifted up, to a higher riding position. The handling becomes more nervous and there is an increased risk of an OTB. The steeper the hill and the harder the front brake is applied, the more this effect is noticed. I always hit the inside of my knees off the frame at rear pivot as this is placed on the top tube, very close to the saddle tube. The frame is very wide at this point. This is a great bike, but it also has one large flaw. I love riding technical cross country on this bike. It's just so fast, stiff and responsive. But I get a bit nervous when I have to brake hard going down steep hills. Cannondale Super V, lots of hardtail bikes, YT Tues DH downhill bike, Giant DH Team downhill bike. This bike is very different from any other full suspension bike and has received an unwarranted reputation for "stinkbugging". Those who have experienced that problem with the Mantra series have not taken the time to understand the design. Gary Klein designed the bike to be ridden as rear suspension only with a rigid fork, so you need to use a much stiffer fork setting than you would on any other bike. The rear shock compresses when the front wheel hits a bump, so you can get away with a stiffer setup (such as the original boron wrapped aluminum fork Gary intended the bike to have). 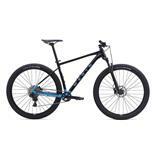 Do that, and stay in the saddle on steep descents and you will have no troubles - except for the fact that it is a very quick steering bike (designed for single track)so it can be handful at very high speeds. It is right up there with the Maverick/Palomino in being the only full suspension bikes that rival hardtails in climbing. I have never ridden another cross country bike that makes me feel more at home on the bike than this one. For me it engenders a feeling of confidence that has been unmatched by any other. not ballanced suspension travel.location of pivot causes head tube angle to radically change in g out situations. overall this bike is terrible for anything but pavement use.Look for real suspension such as fsr. is there anything as poorly designed? This was the first MTB I ever bought, to keep me fit in London. I loved it from the day I got it, and still rate it. I have seriously thrashed it all over England, Wales, and New Zealand, hence the non-standard components (4th set of forks, 2nd drivettrain etc etc). Fail to understand the fuss over the downhill aspects. Maybe coz this was my first bike i just assumed that it was how it was. I have taken this bike full noise down some good sized mountains and found it to be less frightening than my other bike - a hardtail Cannondale. I still prefer it for downhill over any of my friends bikes. Maybe its the way i ride, or the fact that I am a smaller guy, but I found that keeping off the seat and my weight over the bars and keeping the front planted where I wanted it, the back of the bike did a great job of soaking up the bumps and holding the line. Its never thrown me or become unstable or complained about me jumping off buildings or big drops. The frame is still as solid as the day I bought it. Its rigid, light, and just makes me feel more confident about going hard, which is what a great bike is all about. I would *never* sell my Mantra. One of the best toys I ever bought! Without a doubt one of the coolest mountain bikes ever made and *still* better than any other FS bikes made today. Totally love it. Those who own a Klein are usually xc or climbers. I love the brutal climbs. After buying my first Klein I was religiously hooked, never to go back. I still have my Adroit(will NEVER part with it) and my Attitude, so I will switch off riding a bit. I was amazed at how well the Mantra climbed. Back when I bought it I still lived in So Ca and mostly rode the local mountains...San Juan trail, Harding trail, Joplin, etc. I love my hard tails but this was a nice change. Soon we headed to Moab and I tried it on some of the most brutal trails on earth. I love my adroit but theres no way I'm taking it down the Portal trail (it's built up fully rigid). The Mantra has never disappointed me. I bought it new in 1998 and have ridden it consistently ever since. I can not think of any issue I have ever had with it. Would I buy it again if it was lost? IN A SECOND!! It has been a GREAT investment! Good Parts for its time. Solid Frame. Best Paint job. only 24 speed with no gear indicators. I have been ridding a hard tail for around 7 years and just the upgrade to a dual suspension already makes my back and bottom say thankyou. The bike preforms wonderfully on light trails and Road due to the OLD but still efficient Shock system front/rear. I have only tested it in Forest Park NY and road and it has taken all the big hits no problem. It is ULTRA LIGHT even with the old technology and does feel safe and easy to control. I recomend this bike to any one that can buy one under $800 and plans to upgrade some parts. you will definetly be happy and you will be sure to get a lot of WOWS just cruising down yor block. PS. keep the seat low when doing heavy down hill it can be a little scary, But climbs like a monkey. Trek 7000 w/upgrades, Cannondale Raven 700x W/lefty. Klein managed to create a wonderful design with the one-tube frame and deserves full credit for it. This bike belongs in the museum of modern art, as far as I am concerned. A modern classic I am proud to own and enjoy every time I ride it.